Use me to create and roll 3d cubes with your OWN design based on photos from contacts or images on your phone. You can have unlim num of cubes and select up to six to display at the same time. To roll just shake or swipe your finger across screen. 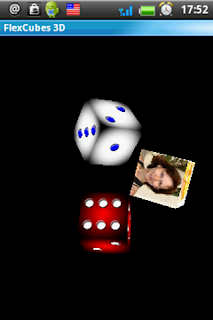 You can create cubes for different purposes like board games, decision makers, who is next, (e.g. based on photos of your friends), Cadoo games ... just switch on your imagination. when in main screen press (Menu button->Choose cubes ..) then check/uncheck ones you want to display. You can save any shared cube for further using: just click import button on your screen. You can also share your cubes with your friends only or with everybody. I will describe details further. I start loading images for the sides of shared cubes as soon as you click on the particular shared cube but I save them to cache so next time you run me I will take the images from cache. In general every image is about 15kb. The cache is located in root of your SD card in folder FlexCubes3dCache. If you do not have external drive like SD the cache is located in special folder assigned by Android and can not be seen. just press (Menu button->Manage cubes ..) when you are on main screen. add, edit, del are pretty straight forward so I put more details about share and clone feature. I am designed to work with images of 128x128 pixels. So If you try to add image of diff. size I try to resize (do not worry original one will stay untouched). If you are not satisfied with result the best idea will be crop the image by yourself or create fake contact then Android will take care about cropping. Clone - the reason I have clone features - just to save your time if e.g. you need set of cubes with exact the same design. Share - you can share any of your cubes. What I do is zip the selected cube and generate email with attached zipped cube - so you can send email to your friends only or if you keep my author as addressee you cube will be published in shared cubes section. 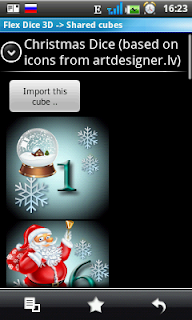 press (Menu button->Manage cubes .. -> Import zipped cube ..) when you are on main screen. I keep last zipped cube and sides' images in the same cache as described above. Christmas -> thank you Tanya (http://artdesigner.lv/) for the icons. Skin was done based on Tanya`s icons. 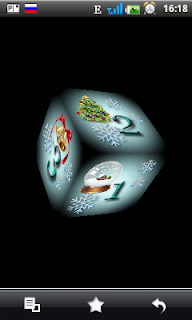 skin for FUDGE role playing game <- shared by Lindsey Dubb. Some samples ..